— This article by Jerry Cates was first published on 18 April 2016, and revised last on 11 September 2016. © Budsinthenews Vol. 7:4(1). Spearmint, also spelled as two words, i.e., spear mint — is named for its pointed leaf tips, and is native to much of Europe and Asia. It is now cultivated throughout the world. A herbaceous perennial, it grows from 30–100 cm tall above ground, with wide-spreading fleshy underground rhizomes. Leaves have serrated margins and measure 5–9 cm in length and 1.5–3 cm wide. As with all members of the mint family, the stem has a square cross-section. Its flowers form slender spikes, with each white or pink flower measuring 2.5–3 mm in length. Spearmint readily forms hybrids with watermint (M. aquatica) [ Mentha × piperita = peppermint], with wild or corn mint (M. arvensis) [Mentha × gracilis = ginger mint], and with apple mint (M. suaveolens) [Mentha × villosa = large apple mint]. A hardy plant, spearmint prefers loamy soils rich in organic matter, in partial shade. It grows well, however, in full sun and in shady spots throughout most temperate climes. Gardeners usually confine it to pots or planters to keep its aggressive rhizomes under control. Spearmint leaves, which when properly collected can be used fresh, dried, or frozen, lose their aromatic appeal after the plant flowers. Experienced collectors dry the leaves by cutting just before, or immediately upon the opening of the flowers, when the leaf aromatics are at their peak of concentration. Cuts are made one-half to three-quarters of the distance down the stalk so as to permit smaller shoots room to grow. Spearmint is famous for its aromatic spearmint oil, whose most abundant constituent, R-(–)-carvone (60-70%), is responsible for its distinctive fragrance. Spearmint oil also contains R-(-)-limonene (13-20%), (1)-dihydrocarvone (3-5%), and eucalyptol [1,8-cineol] (3-5%), β-pinene (2-3%), trans-Dihydrocarvyl acetate (1-2%), and cis-Carvyl acetate (1-2%), but — unlike oil extracted from its hybrid with water mint, peppermint — spearmint has only minimal amounts of menthol and menthone. Essential oil research has shown spearmint oil to possess significant antifungal activity. It has been used with some success against food poisoning pathogens. The Ames test, which uses bacteria to determine whether specific chemicals cause mutations in the bacteria’s DNA, indicates spearmint oil is not mutagenic. Though spearmint extracts contain only one form of carvone, specifically the righ-thanded enantiomer R-(-)-carvone, a discussion on that form of carvone, alone, would only tell half of the story. Carvone, the name of the generic molecule, undifferentiated in terms of its two enantiomers, exists in nature in two distinct forms, and humans perceive each of those forms differently. 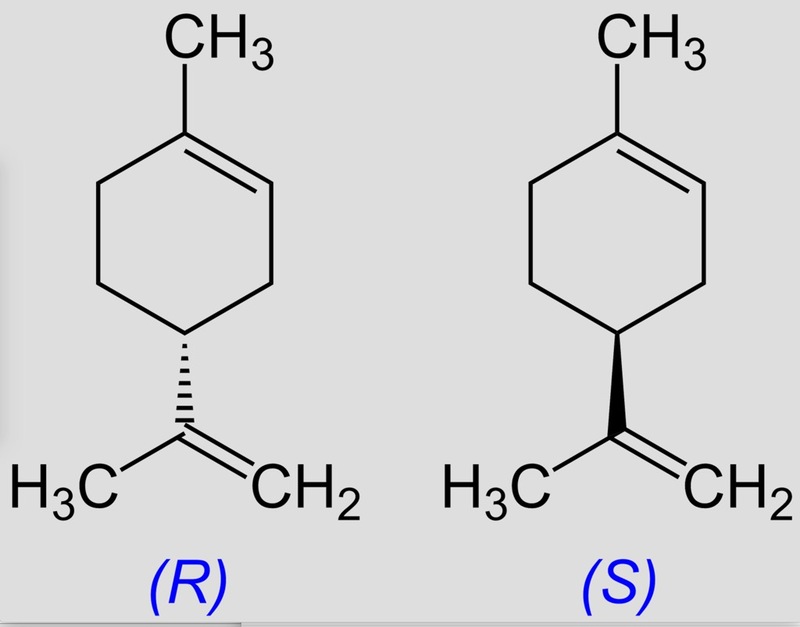 More about that below, but first, note that carvone is a terpenoid (also known as an isoprenoid). Terpenoids are a subclass of the prenyllipids (terpenes, prenylquinones, and sterols); they represent the oldest group of small molecular products synthesized by plants and are probably the most widespread group of natural chemicals produced by plants. 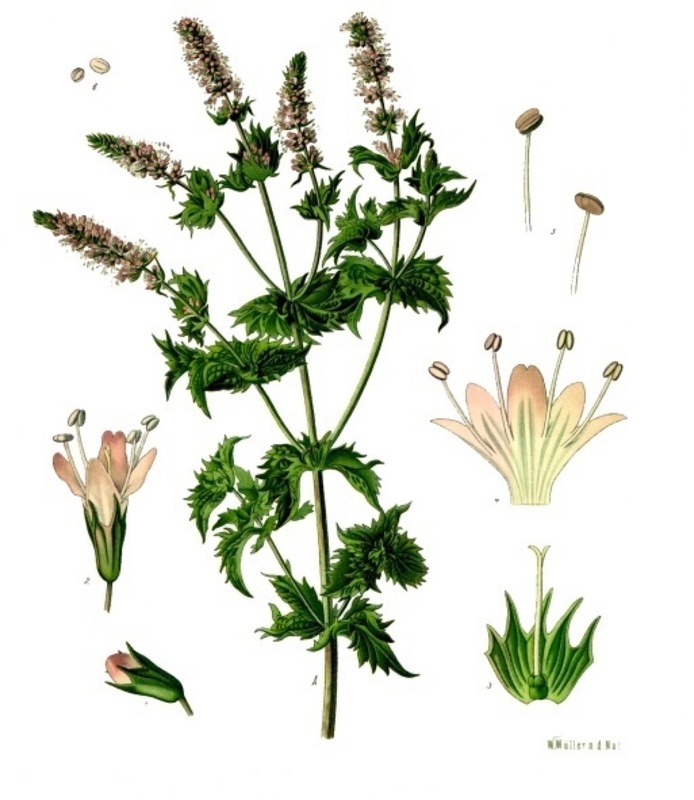 Carvone is found naturally in many essential oils, and most abundantly in oils extracted from caraway (Carum carvi) seeds, spearmint (Mentha spicata) herb, and dill (Anethum graveolens) herb. The latter, though like the mints is an asterid, is not in the mint family (Lamiaceae), but is instead a member of the celery family (Apiaceae). 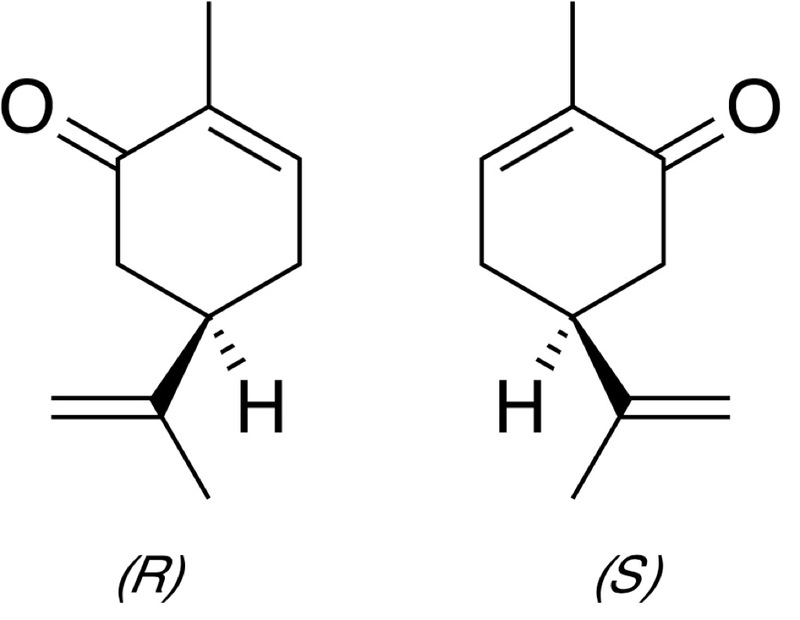 As alluded to earlier, the carvone molecule is arranged structurally in two mirror-image forms or enantiomers: R-(–)-carvone, the right-handed form, is what imparts to spearmint leaves their unique odor. Carvone’s left-handed mirror image, S-(+)-carvone, imparts the less unique odor possessed by caraway seeds and dill. The fact that the human olfactory sense distinguishes between these two enantiomers proves that human olfactory receptors have chiral groups that allow them to respond more strongly to one enantiomer than to the other. Not all enantiomers have distinguishable odors, and not all animals have chiral groups in their olfactory organs, but it is known that squirrel monkeys, like humans, are able to discriminate between the two carvone enantiomers. Like carvone, limonene is a chiral molecule with two enantiomers. 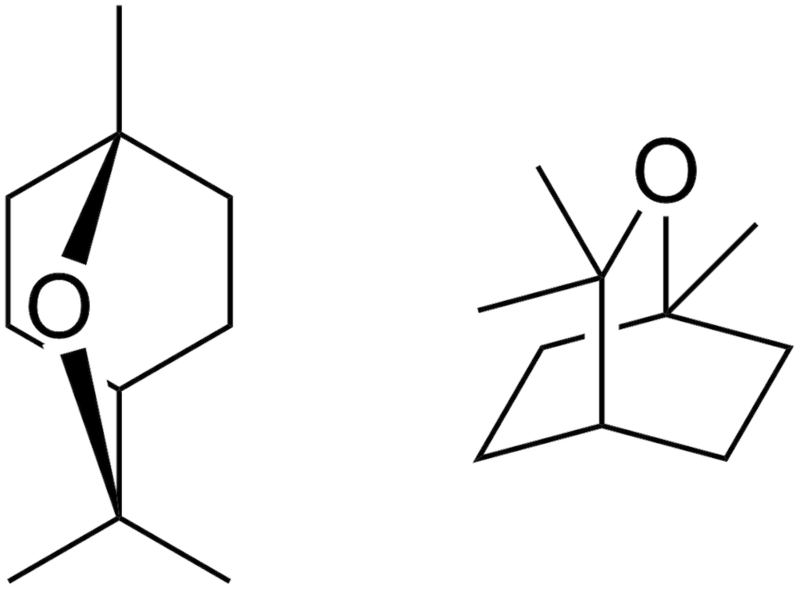 D-limonene, the right-handed enantiomer, is one of the most common terpenes in nature, and is responsible for the fragrance imparted in oranges. The left-handed enantiomer, S-limonene, is responsible for the fragrance imparted in lemons. Both enantiomers are considered to exhibit low mammalian toxicity. In tests for carcinogenicity in mice and rats, initial results showed d-limonene increased the incidence of renal tubular tumors in male rats, though female rats and mice of both genders showed none. Later studies established that d-limonene does not pose a mutagenic, carcinogenic, or nephrotoxic risk to humans. In humans, d-limonene has demonstrated low toxicity after single and repeated dosing for up to one year. As a solvent of cholesterol, d-limonene is capable of dissolving cholesterol-containing gallstones. As a gastric acid neutralizer, and because it supports normal peristalsis, it provides relief from heartburn and aids in reducing or eliminating gastroesophageal reflux (GERD). D-limonene also exhibits chemopreventive effects against a number of cancerous tumors. As can be seen from its chemical structure, dihydrocarvone, carvone, and limonene are remarkably similar. It is not surprising, therefore, that all three share a number of traits that impact human biology. In a study published in 2009 (Patil et al. ), when extracts of Key Lime (Citrus x aurantifolia) were analyzed for their essential oil constituents, they were found to contain 30.47% D-dihydrocarvone and 30.13% D-limonene. The oil was then tested against human colon cancer cells and showed 78% inhibition of those cells when placed in a 100 μg/ml concentration for 48 h. Further tests suggested that lime volatile oil has potential benefits in colon cancer prevention. Eucalyptol, a natural organic compound that in isolation forms a colorless liquid, is a cyclic ether and a monoterpenoid first described by F. S. Cloez in 1870, who found it to be the dominant fraction of oils extracted from the blue gum tree (Eucalyptus globulus). It is variously known as 1,8-cineol, 1,8-cineole, cajeputol, 1,8-epoxy-p-menthane, 1,8-oxido-p-menthane, eucalyptol, eucalyptole, 1,3,3-trimethyl-2-oxabicyclo[2,2,2]octane, cineol, and cineole. Though In higher-than-normal doses, eucalyptol is hazardous via ingestion, skin contact, or inhalation, can have acute health effects on behavior, respiratory tract, and nervous system, is classified as a reproductive toxin for females and is a suspected reproductive toxin for males, eucalyptol has a number of important medicinal properties. In addition, it is often used as an ingredient in insecticides and insect repellents. 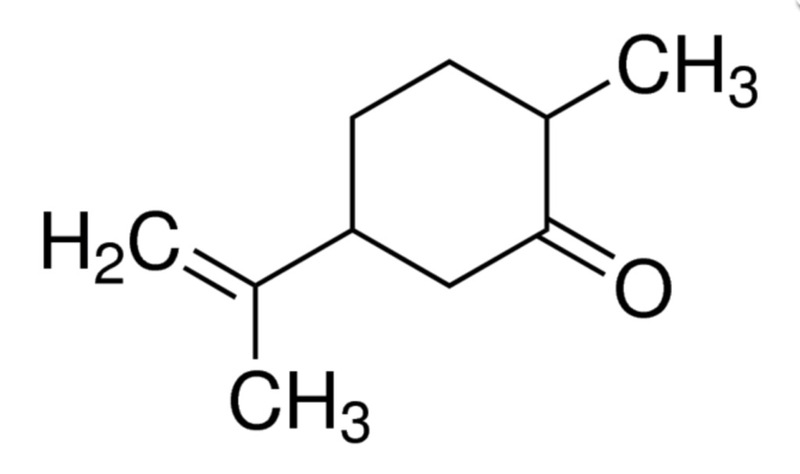 Eucalyptol is one of several compounds that attract males of various species of orchid bees. For this reason it is commonly used as bait to attract and collect such bees for study. For example, it has been shown that males of Euglossa imperialis, a non-social orchid bee, are attracted by eucalyptol, and in its presence exhibit exaggerated territorial behavior. These males were found to periodically leave their territories to forage for chemicals such as eucalyptol, which are used to synthesize sociochemicals, or pheromones, that attract females of the species. Though eucalyptol comprises over 90% of the oils extracted from certain species of eucalyptus, in spearmint oil it constitutes only 3-5% of the total. References: In process… we do not post references that are not in our at-hand library and that we have not thoroughly examined. The vetting process takes time. A list of appropriate references relevant to the matter presented in this article will be posted as they become available. — Feel free to e-mail jerry.cates@entomobiotics.com regarding your comments on this article. You may also register, log in, and leave a detailed comment in the space provided below.